On Monday, one of my friends shared a Dressage Today article about horses that have trouble coming back after a lengthening in the canter. The author said horses like this often tend to travel with their outside shoulder to the outside of the hindquarters which gives them the ability to roll along unimpeded (my paraphrasing, I can't find the article now). I don't know anyone who travels like that WHY DO YOU ASK???? That's something NK has said about us as far back as early 2012 - "This horse likes to travel diagonally!" And while it's better now, it's still not great, and I've noticed he tends to go really well when I focus on containing the outside shoulder. So I thought I'd play around with that a bit on my own on Monday night. I greatly oversimplified it by thinking "I should be able to get 1-2 steps of turn on the forehand feel anytime I want them." Sometimes I made it a little more dramatic, sometimes it was subtle, but it was non-negotiable. It was a schooling show so we got a generous score and "needs more angle" on this movement, which like...we're not even doing it here so...thanks? Back with his shoulder plastered to the rail, because he totally has my number. Thanks Karen for taking these! I am not qualified to say whether the ToF idea is the right way to go about things, but we did get our first c-w transition Monday night! We got it once, and then we weren't able to get it again. 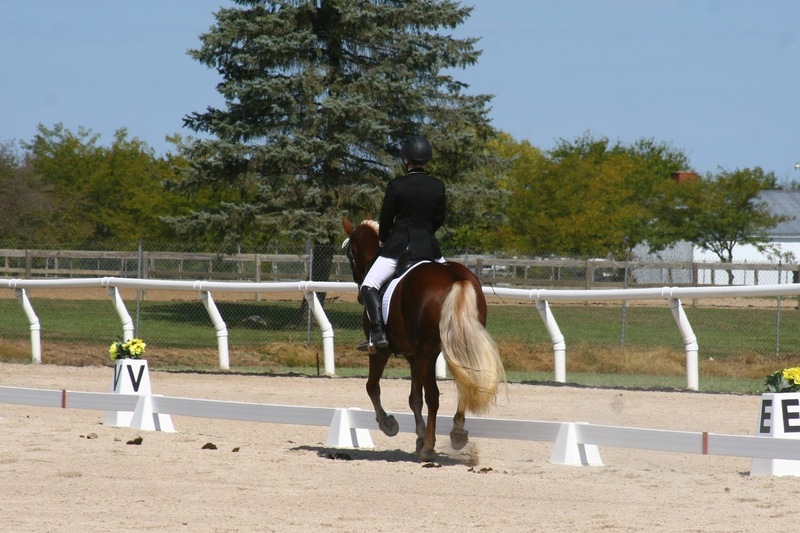 I did 1-2 steps of thinking ToF, then picked up the canter, then asked for it within 5 strides of takeoff. It's much more difficult for me to get the ToF steps to the left than to the right. 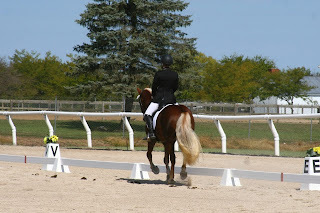 It's partially because my right leg has a tendency to not be on him so he just escapes out that side rather than stepping under, but it's also just his harder direction to get the inside hind (yes, those two things are definitely related, and I am fixing the problems I created!). So in conclusion, this is yet another thrilling chapter in the dramatic saga of learning that inside leg to outside rein is important. You're welcome! It has some really great tips to help exactly what you are working on. Might be worth a look! Sorry the link made a mess. Its the German Riding and Driving system advanced techniques. Ugh yes I feel like my horse lives in a perpetual shoulder-fore these days! Especially in the canter.